Do you dream of buying a newly-constructed home? Would you struggle to afford two mortgages? 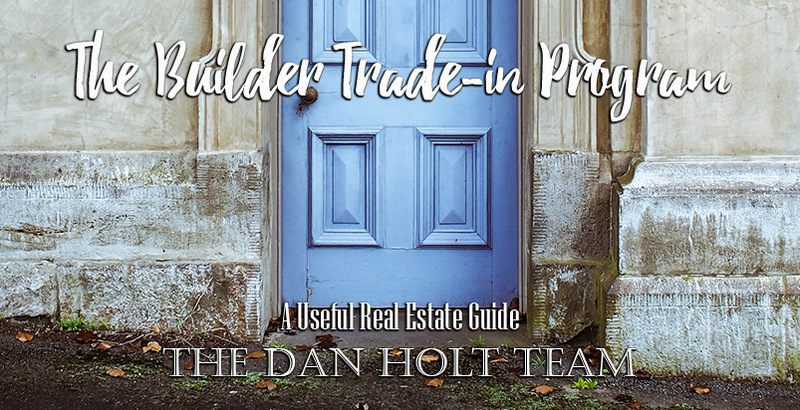 The Dan Holt Team is now exclusively offering the Builder Trade-In Program! Dan Holt works closely with the area’s best builders and has developed a program designed to make your home building experience easier. The Dan Holt Team at Keller Williams has just developed the first local builder trade-in program. If you’ve ever dreamed of buying or building a new home but you have a house to sell first, this program might work great for you. Because both selling a house and building a house are challenging, tying the two together perfectly with no risk is almost impossible. We’ve developed an almost bulletproof builder trade-in program with the area’s best builders to simplify your transition to a brand new home. The builders we work with are building in almost all the major area subdivisions and in all various price ranges. Discounts on materials – If you work with suppliers, you can often get better discounts when building a home. Features like light fixtures and lumber can often be obtained for less than simple renovations. Everything is new – Moving into an existing house sometimes comes with hidden costs, things like repairs and mandatory upgrades may cost you more than building new. Design control – Most importantly, you can create the exact home design you want. Interested in having a game room? Include it in the design plan and watch it become reality. Long-term savings – Often times having newer amenities can result in major savings for utilities and upkeep. Having a brand new air conditioner with new insulation can result in major savings over time. Our builders have many homes under construction that are not yet on the market. The Dan Holt Team will do whatever it takes to make sure you get into the home of your dreams. If that means building to your exact specifications, we’ll guide you through the home building process. Make sure to call the Dan Holt Team so you can be the first person to see the new houses as they are being built. Specific details of the Builder Trade-in Program can be obtained by calling us at (417) 812-5055 and speaking to one of our professional representatives.